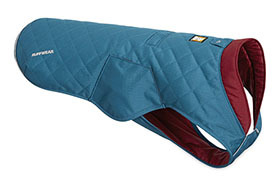 The Ruffwear Stumptown is a classic, everyday jacket that combines insulation and durability. With a modern, quilted design, the Stumptown Jacket is at home anywhere. And, itts abrasion-resistant exterior shell holds its own on the trail. Recycled insulation provides cozy warmth on clear, cold days, and the leash portal allows the Stumptown to be worn over most harnesses.